1. To move together in a body or group from one country, or place, to another location for permanent residence: One of the problems that exists during commigrating is that sometimes there are religious conflicts between christians and muslims. 2. 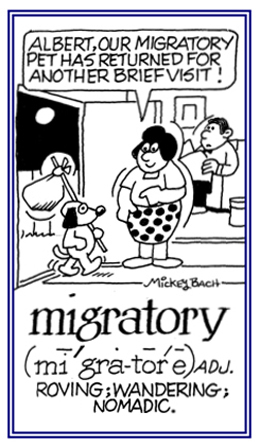 Etymology: from Latin commigrare, "to migrate together"; from com, "with, together" + migrare "to move from one place to another, to change". 1. A reference to moving under the influence of electric currents. 2. Relating to the transfer of mass which occurs in a metal as a result of the movement of ions under the influence of an electrical current. 3. Pertaining to a procedure that is used to separate isotopes; as in chemistry. Someone who leaves his or her native country to go and to live in another area of the world. 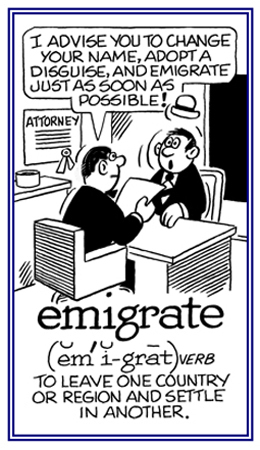 To leave a country or region permanently and to live in another one: Emigrate is used only with reference to people and implies a permanent move, generally across a political boundary. © ALL rights are reserved. 1. The process of leaving one's place of residence, or country, to live elsewhere. 2. The movement of inhabitants from one governing state to a different one for the purpose of residing in a new place. 3. In medicine, the passage of white blood cells through the endothelium and wall of small blood vessels. 1. Someone who flees from his or her native land because of political conditions or destruction by bombings and attacks by terrorists or those who want to overthrow the government with violence. 2. A person who fled from France because of opposition to, or fear of, the revolution that started in 1789. 1. To go to a new nation for the purpose of living there or to establish them as permanent residents: To immigrate is the movement that is related to a different destination or going into another geographical area. 2 In botany and zoology; to become established in a new environment. 1. Going into another habitat; especially, a movement to a country of which one is not a regular resident in order to settle there. 2. The body of people or animals arriving in a different place during a specified interval. 1. A traveler who moves from one foreign region to a different one. 2. Someone who is habitually moving from place to place; especially, in search of seasonal work. 3. A person who belongs to a normally migratory culture who may cross national boundaries, or who has fled his or her nation for economic reasons rather than a fear of political or ethnic persecution. 4. An animal, especially a bird, that moves from one region to another, often at the same times each year in order to breed or to avoid unsuitable weather conditions. 5. An itinerant worker who travels from one area to another in search of work. The main institutions that are trying to protect migrants say that criminal gangs are profiting from the desire for a better life, and believe they have a reasonable picture of how the networks operate. Criminal involvement has enabled a surge of illicit immigration into the European Union, and the inbound routes are always shifting, as criminals assess the risks and rewards. So lucrative are the rackets that officials believe organized crime is largely to blame for the six-fold increase last year in illegal migration from African shores to the Canary Islands of Spain. The economics of clandestine migration are all in favor of the gangs. The United Nations Office for Drugs and Crime has estimated that the transportation of migrants from Africa to Europe nets criminal gangs about 300 million euro a year (more than 405 million dollars). Once their passages have been paid, the migrants, hidden in safe houses until 100 or more are ready to depart, are vulnerable to extortion; smugglers commonly demand still more money for food, a better motor, or a satellite navigation system. According to some authorities, the traffickers, with the fees in their pockets, have little interest in the boat's reaching its destination. Trading on dreams of a better life in EU"
by Caroline Brothers; IHT March 20, 2007; pages 1 & 8. 1. To move from one region or homeland to another one, often to seek work or for better other economic opportunities. 2. To move from one habitat or environment to another in response to seasonal changes and variations in food supply. 3. To move from one part of an organism or substance to another; such as, cells moving during the growth of an embryo. 4. 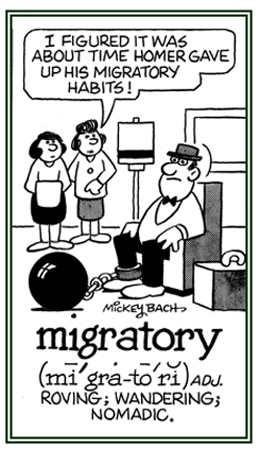 To change locations periodically; especially, by moving seasonally from one region to another: Migrate may refer to people and animals and it implies a lack of permanent settlement. 5. To transfer a file from one computer system or database to another one: The use of migrate as a verb form is in common use by those in the computer business with the meaning of "to change" or "cause to change from using one system to another" or "to transfer programs or hardware from one system to another" and these meanings seem to have originated within the realm of computer programmers or certain users. 1. A process in which human populations go from one regiion to another one; usually, resulting in cultural contact with their new environments. 2.A group of birds, fish, or other animals that are going together from one region or country to another for feeding or breeding purposes. 3. A group of people moving together; especially, in some given time period. 4. In chemistry, the movement of ions under the influence of an electric field. 5. The movement of an atom, or a group of atoms or double bonds, from one part of a molecule to another. 6. A transfer of computer data, programs, or hardware from one system to another. 7. The movement of oil, gas, contaminants, water, or other liquids through porous and permeable rock. 8. A condition or process of extraction, in which an aqueous or organic solvent selectively dissolves part of an adhesive film and carries it to a different location as the solvent evaporates. Animal migration is a predictable, recurring group movement that is characteristic of the members of a given species, and which occurs regularly in response to seasonal changes in temperature, precipitation, food availability, etc. The process usually involves a round-trip movement between two areas, to seek a more suitable breeding place, a greater food and water supply, or other more favorable environmental conditions. A reference to behavior and adjustments made by those who are fleeing to another nation and those people where the migrants are relocating: Some of the migrational problems involve the kinds of food that the immigrants are accustomed to eating and the financial support which they require in their new abodes. 1. Pertaining to birds, fish, or other members of the animal population which move from one habitat to another; usually, at the same time every year, in order to breed or to avoid unsuitable weather conditions: Swallows are migratory species that make long flights from the north to the south in the winter, even as far as to the tropics! 2. Referring to people who are habitually going from place to place; especially, in search of seasonal work or in order to achieve better living conditions: Men and women, and sometimes whole families, are migratory examples when they travel from one state to another to help with harvesting in the fall. 3. A reference to the tendency to wander from one national region to another one without settling down in one place for any length of time; nomadic; wandering: When it is very cold in the north, especially in winter, some people have a migratory tendency to move to the south, without establishing themselves there at all, and then back to the north when the climate is warmer. © ALL rights are reserved.